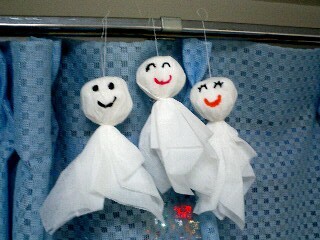 Teruteru-bozu, are little hand made dolls, made from cloth. These dolls are hung outside or near a window during the Japanese rainy season. The dolls are said to bring good weather and keep the day dry. Here is a great little video showing you how you can make a doll yourself. Posted by theloveofjapan on July 10, 2011 in Traditions, Videos and tagged crafts, japan, japanese, rainy season, teru teru, Teruteru-bozu, traditional, video.